We will derive the entire 33°C greenhouse effect using the 1st law of thermodynamics and ideal gas law without use of radiative forcing from greenhouse gases, nor the concentrations of greenhouse gases, nor the emission/absorption spectra of greenhouse gases at any point in this derivation, thus demonstrating that the entire 33C greenhouse effect is dependent upon atmospheric mass/pressure/gravity, rather than radiative forcing from greenhouse gases. Secondly, we will show why multiple observations perfectly confirm the mass/gravity/pressure theory of the greenhouse effect, and disprove the radiative forcing theory of the greenhouse effect. Note, this physical derivation is absolutely not suggesting the ~33C greenhouse effect doesn't exist. On the contrary, the physical derivation and observations demonstrate the 33C greenhouse effect does exist, but is explained by a different mechanism not dependent on radiative forcing from greenhouse gases. Also note, it is impossible for both explanations of the greenhouse effect to be true, since the global temperature would have to increase by an additional 33C (at least) above the present. You cannot have it both ways. We will show how the mass/gravity/pressure theory causes the temperature gradient and that the emission spectra of greenhouse gases seen from space are a consequence rather than the cause of that temperature gradient. "...In the convective equilibrium of temperature, the absolute temperature is proportional to the pressure raised to the power (γ-1)/γ, or 0,29..."
Twenty four years later, Arrhenius devised his radiative forcing theory of the greenhouse effect, which unfortunately makes a huge false assumption that convection doesn't dominate over radiative-convective equilibrium in the lower atmosphere, and thus Arrhenius completely ignored the dominant negative-feedback of convection over radiative forcing in his temperature derivations. Johns Hopkins physicist RW Wood completely demolished Arrhennius' theory in 1909, as did other published papers in 1963, 1966, 1973, (and others below), but it still refuses to die given its convenience to climate alarm. We now know from Robinson & Catling's paper in Nature 2014 (and others) that radiative-convective equilibrium on all planets with thick atmospheres in our solar system (including Earth of course) is dominated by convection/pressure/lapse rate in the troposphere up to where the tropopause begins at pressure = 0.1bar. When P < 0.1 bar, the atmosphere is too thin to sustain convection and radiation from greenhouse gases takes over to cause cooling of the stratosphere and above. Since Maxwell's book was published in 1872, many others have confirmed that the greenhouse effect is due to atmospheric mass/pressure/gravity, rather than radiative forcing from greenhouse gases, including Hans Jelbring, Connolly & Connolly, Nikolov & Zeller, Mario Berberan-Santos et al, Claes Johnson and here, Velasco et al, Giovanni Vladilo et al, Heinz Thieme, Jacques Henry, Stephen Wilde, Alberto Miatello, Gerhard Gerlich and Ralf D. Tscheuschner, Verity Jones, William C. Gilbert & here, Richard C. Tolman, Lorenz & McKay, Peter Morecombe, Robinson and Catling, and many others, so this concept is not new and preceded the Arrhenius theory. As, within a fluid mass in equilibrium, pressure and density does not vary along the horizontal axes (X and Y), the related partial derivatives equal zero. But, in the remaining vertical dimension, the partial derivative is non-zero, with density and pressure varying inversely as a function of fluid height (density and pressure decrease with increasing height relative to the bottom) and, considering gravitational force as a constant connected to the measure of density, thus equation (2) can be derived. where U is the total energy of atmospheric system in hydrostatic equilibrium and equal to the sum of the thermal energy (kinetic plus dissipative and vibro-rotational), the specific heat C(p) multiplied by the temperature T plus the gravitational potential energy, with gravitational force g at height h of the gas. In this case, because the force of gravity has a negative sign as the system is undergoing work, the potential energy ( -g × h) can be equated to the mechanical work (-W) that the system undergoes in the 1st Law of Thermodynamics. This is a splendid equation, describing precisely the temperatures’ distribution of a gas (as the air of Earth’s atmosphere) in hydrostatic equilibrium between the 2 forces of the lapse-rate (preventing the collapse of the atmosphere at the Earth’s surface) and gravity (preventing the escape of the atmosphere in the void of space). We are determining the temperature gradient within the mass of the atmosphere using a linear function of atmospheric mass (the lapse rate), therefore the equilibrium temperature is located at the center of mass. The "effective radiating level" or ERL of planetary atmospheres is located at the approximate center of mass of the atmosphere where the temperature is equal to the equilibrium temperature with the Sun. The equilibrium temperature of Earth with the Sun is commonly assumed to be 255K or -18C as calculated here. As a rough approximation, this height is where the pressure is ~50% of the surface pressure. 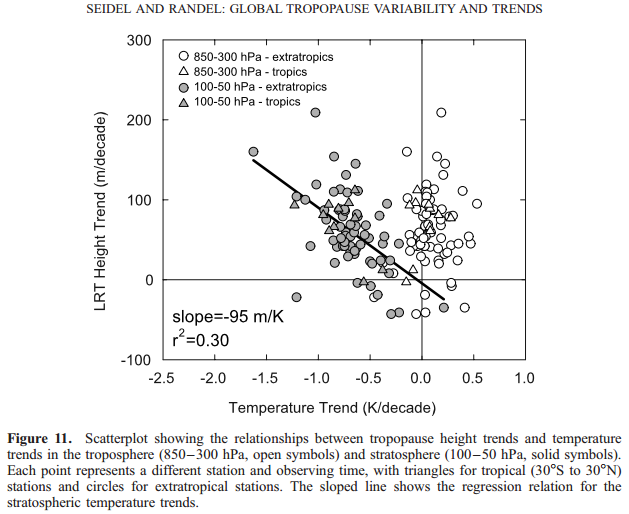 It is also located at the approximate half-point of the troposphere temperature profile set by the linear adiabatic lapse rate, since to conserve energy in the troposphere, the increase in temperature from the ERL to the surface is offset by the temperature decrease from the ERL to the tropopause. Fig 1. From Robinson & Catling, Nature, 2014 with added notations in red showing at the center of mass of Earth's atmosphere at ~0.5 bar the temperature is ~255K, which is equal to the equilibrium temperature with the Sun. Robinson & Catling also demonstrated that the height of the tropopause is at 0.1 bar for all the planets in our solar system with thick atmospheres, as also shown by this figure, and that convection dominates over radiative-convective equilibrium in the troposphere to produce the troposphere lapse rates of each of these planets as shown above. 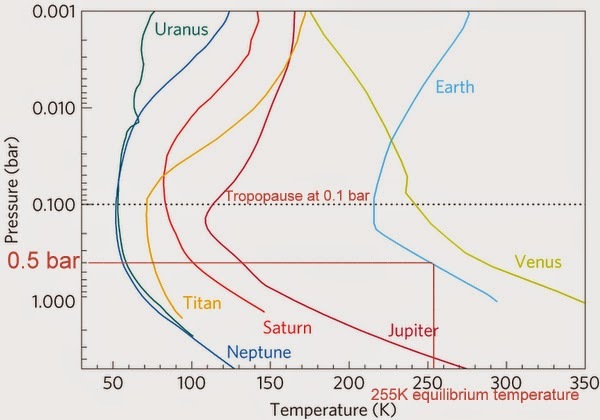 R&C also show the lapse rates of each of these planets are remarkably similar despite very large differences in greenhouse gas composition and equilibrium temperatures with the Sun, once again proving pressure, not radiative forcing from greenhouse gases, determines tropospheric temperatures. showing a cooling effect of up to 25C just from changes in the lapse rate from water vapor. Water vapor also cools the planet via evaporation and clouds, and which is confirmed by observations. Water vapor is thus proven by observations and theory to be a strong negative-feedback cooling agent, not a positive-feedback warming agent as assumed by the overheated climate models to amplify warming projections by a factor of 3-5 times. What about CO2? At only 0.04% of the atmosphere, CO2 contributes negligibly to atmospheric mass and only slightly increases the heat capacity Cp of the atmosphere, which as we have shown above, is inversely related to temperature. CO2 would thus act as a cooling agent by slightly increasing troposphere heat capacity. Increased CO2 also increases the radiative surface area of the atmosphere to enhance outgoing radiation to space, analogous to putting a larger heat sink on your microprocessor which increases radiative surface area and convection to cause cooling. It is well-known that CO2 and ozone are the primary cooling agents of the stratosphere up to the thermosphere, but even the warmist proponents are unable to agree on a coherent explanation why CO2 would assume the opposite role of a warming agent in the troposphere. As the mass/gravity/pressure greenhouse theory shows, and just like water vapor, CO2 also acts to cool the troposphere, and the rest of the atmosphere by increasing radiative surface loss and outgoing radiation to space. Millions of weather balloon observations confirm that there is no greenhouse gas-induced "hot spot" in the mid-upper troposphere, which is the alleged "fingerprint of AGW." The 2nd law of thermodynamics principle of maximum entropy production also explains why such a "hot spot" will not form. However, observations do show a cooling of the stratosphere over the satellite era, which would be consistent with increased CO2 increasing outgoing radiation to space. Observations also show an increase of outgoing longwave radiation to space over the past 62 years, which is entirely consistent with increased outgoing radiation from greenhouse gases and a decrease of "heat trapping", the opposite of AGW theory. In essence, the radiative theory of the greenhouse effect confuses cause and effect. As we have shown, temperature is a function of pressure, and absorption/emission of IR from greenhouse gases is a function of temperature. The radiative theory tries to turn that around to claim IR emission from greenhouse gases controls the temperature and thus pressure and heat capacity of the atmosphere, which is absurd and clearly disproven by basic thermodynamics and observations. The radiative greenhouse theory also makes the absurd assumption a cold body can make a hot body hotter, disproven by Pictet's experiment 214 years ago, the 1st and 2nd laws of thermodynamics, the principle of maximum entropy production, Planck's law, the Pauli exclusion principle, and quantum mechanics. There is one and only one greenhouse effect theory compatible with all of these basic physical laws and millions of observations. Can you guess which one it is? Update: The atmospheric center of mass assumption in step 2 above also appears to be applicable to Titan, the closest Earth analog with a thick atmosphere in our solar system. For Titan, the surface temperature is 94K, equilibrium temperature with the Sun is 82K, and surface pressure is 1.47 bar. 1) A purely radiative model of the atmosphere without convection sets the ERL too high, at ~7km instead of ~5 km where observations show it is located. At 7km altitude, observations show the temperature to be 242K instead of the equilibrium temperature of 255K. 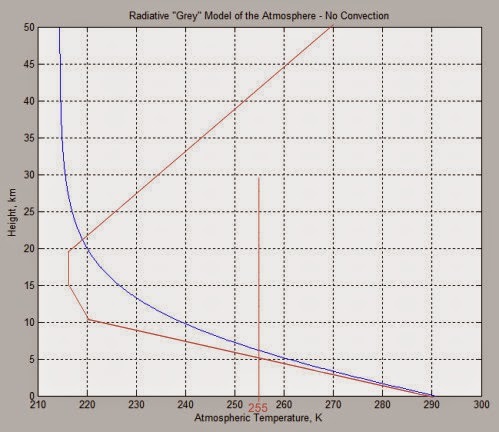 Solely radiative "greybody" model of the atmosphere without convection shown in blue. I have added in red the actual temperatures from the US Standard Atmosphere calculator. Note how the purely radiative model is up to 20K hotter, e.g. at the top of the troposphere, than the observations show. This is because convection dominates and "short-circuits" radiative forcing in the troposphere to cause cooling. "At higher pressures [P > 0.1 bar], atmospheres become opaque to thermal radiation, causing temperatures to increase with depth and convection to ensue. A common dependence of infrared opacity on pressure, arising from the shared physics of molecular absorption, sets the 0.1 bar tropopause"
3. We have already shown that temperature is a function of pressure, and radiance and emission spectra from greenhouse gases are in turn a function of temperature, not the other way around. You are close, but you have not explained how the required thermal energy actually gets into the surface or to the base of the nominal troposphere of Uranus where it's 320K - hotter than Earth's surface. Nikolov & Zeller came close, but they are wrong in assuming high pressure causes high temperature. Temperature and density gradients are formed by gravity. Pressure is a corollary. Robinson and Catling may well get a rough relationship between pressure and temperature, but the physics tells us the temperature gradient is related to the quotient g/Cp reduced a little by inter-molecular radiation. I don’t see these guys explaining the necessary energy flows – as I have done. Why don’t you save your time and spend an hour reading my book, and you’ll then understand energy flows on Venus and probably agree with the two physicists who wrote positive 5 star reviews of the book. Email me a postal address to its.not.co2@gmail.com and I’ll post a free copy. Conduction between sun warmed gas molecules ? I suggest spam binning Doug's 140 personas by filtering on "my book"
Just as a side note,THE James Clerk Maxwell died in 1879, with significant publications in the 1860's and 1870's. So perhaps you are referring to a different Maxwell who was published in 1888. I'm not sure when the 1st edition was published, but if you find out, pls let me know. In the meantime I'll change the date to the third edition 1872 in the post. Your "hydrostatic equilibrium" is identical to thermodynamic equilibrium and that is fundamentally important to understand if you really want to understand the "heat creep" process which is a corollary of the Second Law of Thermodynamics. That non-radiative heat transfer mechanism downwards is what obviates any need for assumed (though impossible) heat transfer from a colder troposphere to a warmer surface. Don't you mean upwards via conduction from the sun warmed surface ? You continue to imply, after all these years, that the surface is always warmer and thus, heats the air directly above, via conduction and that that is how the atmosphere is warmed. Which incidentally, also happens to be a major pillar of the debunked "GHE" hypothesis. Yet the radiosonde data clearly shows that over most of the Earths solid surface, most of the year round, the ground is actually cooler than the air above it. While the oceans covering the remaining 70% of the Earths non-gaseous surface cannot conduct heat the air above because of evaporative cooling. It's about time you changed the record mate! Where the sun is shining the surface is warmer than the air and where it is not shining the air is warmer than the surface. That is on average and through the system as a whole, not necessarily locally or regionally due to winds. The energy held by the air at any given time was initially obtained by conduction from the solid surfaces. Water is different. Solar energy enters past the evaporating layer and then is distributed between water molecules by conduction. Evaporation results but does not fully negate that initial accumulation of conducted energy due to the weight of the atmosphere pressing down on the surface. So, sadly, you are wrong. "Where the sun is shining the surface is warmer than the air and where it is not shining the air is warmer than the surface." Wrong! This is entirely dependant on the surface material. Most of the Earths solid surface that has strong enough incident sunlight to heat the ground above the temperature of the air, is also covered in vegetation. Vegetation does not heat the air by conduction, in fact it cools it. This can be seen in the radiosonde data. Regions of the Earths surface which are not covered in vegetation and do get warm enough to potentially heat the air above are only localised and therefore cannot possibly be responsible for the atmospheres diurnal 2pm max-4am min, temperature cycle. "That is on average and through the system as a whole, not necessarily locally or regionally due to winds. The energy held by the air at any given time was initially obtained by conduction from the solid surfaces." Wrong again Mr Wilde, unless of course you believe wind travels at light speed! If local conditions are stable, the warmest part of the day, the diurnal max, is ALWAYS at 2 pm, regardless of surface material. Again, empirical observation disproves your Wilde assertions. This kind of empirical observation is evidence that incident sunlight heats both the surface and the air. "Water is different. Solar energy enters past the evaporating layer and then is distributed between water molecules by conduction. Evaporation results but does not fully negate that initial accumulation of conducted energy due to the weight of the atmosphere pressing down on the surface." Well, lets see now, if what you say here was correct, then the temperature of the near surface atmosphere would need to always closely track the temperature of the ocean below. I have yet to see any data to support that Wilde assertion. Therefore the ocean is not able to conduct any significant heat to the atmosphere directly above it and again, if it could it would be a purely localised phenomena which cannot account for the diurnal atmospheric temperature cycle. Perhaps you have such data to prove me wrong on that. I look forward to seeing that from you. The temperature of the near surface atmosphere does indeed closely track the temperature of the ocean below. Meteorologists rely on that for predicting temperatures over land when air flows off the nearby ocean. The rest of your post is too confused to merit a response. You have no data the Stephan? A very fine post; thanks much. It was well written and easy to follow. I only wish all the luke-warmers would read it with an open mind. So this could explain why the tropospheric hot spot is missing. Instead of warming, the energy that would have formed the hotspot becomes Gravitational Potential Energy? Indeed, and further, ALL energy that goes into lifting the atmosphere against gravity but which is not radiated to space from within the atmosphere goes to gravitational potential energy. Then it returns to kinetic energy during the inevitable descent and THAT is what raises surface temperature by 33C above the S-B prediction. It is all about mass, gravity and insolation. It is variations in the rate of convection that regulates the flow of kinetic energy back to the surface from gravitational potential energy higher up which negates the thermal effect of radiative gases. Convection controls the balance between radiation and conduction in order to maintain system stability. The article contains the seeds of its own destruction because it says "It is well-known that CO2 and ozone are the primary cooling agents of the stratosphere up to the thermosphere....". For a significant part of the infra-red spectrum emitted by the earth back into space it is the temperature of the stratosphere which determines the power radiated into space by the top of the atmosphere. However, the incoming solar radiation is visible light radiation and CO2 and ozone are transparent to those frequencies. Now think about it - say you have an atmosphere with no CO2 and you add some CO2. From the "primary cooling agents" comment above the temperature of the stratosphere goes down, and therefore so does the radiation emitted back into space from the stratosphere and hence the radiation emitted back into space from the top of the atmosphere also goes down. The radiation from sunlight reflected directly back into space doesn't change. Why should it? All we have done is added a miniscule quantity of CO2 which is transparent to visible light. But the incoming radiation doesn't reduce because CO2 has no effect on this. The radiative forcing by definition is the difference between solar radiation received and the radiation emitted back into space at the top of the atmosphere. Adding CO2 makes no different to the incoming or reflected sunlight, but has reduced the outgoing infra-red radiation. Therefore, by the law of conservation of energy it has increased the radiative forcing and the temperature of the surface has to go up. In other words the phrase "It is well-known that CO2 and ozone are the primary cooling agents of the stratosphere up to the thermosphere...." carries with it an implication that adding CO2 must somehow have increased radiative forcing and therefore surface temperatures. We don't even need to postulate a mechanism to know this to be true. "the temperature of the stratosphere goes down, and therefore so does the radiation emitted back into space from the stratosphere and hence the radiation emitted back into space from the top of the atmosphere also goes down." is backwards. Increased CO2 increases IR radiative surface area of the troposphere through thermosphere, but we'll just talk about the stratosphere. CO2 cools the stratosphere both by radiating the heat received primarily from convection from the surface through the troposphere, but also direct IR from the surface through the atmospheric window. I'm sorry, but a cooling agent that enhances radiative losses to space can only cool, not warm, any part of the atmosphere. Assume for the sake of clarity a black-body infra-red spectrum of power emitted from the ground which is dependent on the temperature at every wavelength. Then introduce the CO2 into the atmosphere. In case you didn't know, the atmosphere (with CO2) is opaque to 10 micron radiation emitted directly from the ground - i.e. you cannot image tanks with hot gun barrels and other stuff from space using the 10 micron band. The 10 micron radiation you see from space comes mainly from the stratosphere so anything from the ground has been absorbed and re-emitted many times as seen from space. Therefore, if CO2 cools the stratosphere (which you say it does), and if the direct 10 micron radiation comes from the stratosphere (which it does), then the black-body radiation emitted from the stratosphere must be weaker at all wavelengths purely because the temperature is lower. Sure some radiation still gets through the stratosphere from below, but the power is the same as it was with the original stratospheric temperature before CO2, not higher. Any bands where the radiation comes from the stratosphere have to have a lower power emitted because of the lowering of temperature. Doesn't matter whether the temperature of the stratosphere is because of convection or because of other effects - if it is lower then at certain bands the emissions will be lower with CO2 that without CO2, which means that overall the radiation at the top of the atmosphere emitted back to space is lower as a direct consequence of the lower stratospheric temperature. Thus your phrase "a cooling agent that enhances radiative losses to space" is directly forbidden by the laws of thermodynamics. Note that convection cannot itself carry heat beyond the top of the atmosphere because no molecules are actually lost into space as they don't have the energy to escape. By Wien's displacement law, 15u emission is equivalent to a BB temperature of -80C. No matter where CO2 is located in the troposphere/stratosphere/etc or the concentration of CO2, or the temperature of the surrounding air, CO2 still absorbs/emits at 15u/-80C, which is colder than any part of the atmosphere. There is no convection in the stratosphere. Convection stops at P=0.1 bar tropopause as shown by R&C above. Even the most ardent warmists admit CO2 cools the stratosphere, although they don't agree on why. Here's an illustration of the "atmospheric window" from the surface, showing between 8-12 microns [near-IR with higher energy/frequency] most of IR radiation travels directly from the surface to space without running into any GHGs [except O3 a bit], a large negative radiative forcing. Earth's peak IR emission is at 10-11 microns, where most of it isn't impeded by GHGs at all. "say you have an atmosphere with no CO2 and you add some CO2. From the "primary cooling agents" comment above the temperature of the stratosphere goes down, and therefore so does the radiation emitted back into space from the stratosphere and hence the radiation emitted back into space from the top of the atmosphere also goes down." Radiation to space from within the atmosphere increases from the introduction of GHGs but the amount of energy returned to the surface in adiabatic descent declines so that less energy is then radiated directly to space from the surface leaving the net radiative exchange with space unaffected. Meanwhile the surface temperature is unaffected too because the reduction in energy returning to the surface in adiabatic descent is offset by the increased density of the air at the surface which can then conduct more of the solar energy passing through. Leakage from the adiabatic cycle of ascent and descent (caused by the presence of radiative gases) simply results in a less high atmosphere (less work is done against gravity due to the leakage) and so surface density becomes higher at the same atmospheric pressure. Gas Laws apply at all times. MS, very nice, seems complete and it matches several emperical results regarding IR opaque layers "blocking" heat flow, ie the R. W. Wood experiment from 100 years ago. Did you know that R. W. Wood disproved the exsistence of "N - Rays" as well ? Ah, physicist RW Wood, the world's first CAGW skeptic and prime example of why the best scientists are skeptics of the "overwhelming scientific consensus"
Yes conduction, diffusion, convection (which includes diffusion) from cold to warm in accord with the process described in statements of the Second Law of Thermodynamics. The explanation has been published in March this year in two chapters (complete with graphics) you know where. After all, on Uranus the only source of new thermal energy is mostly in the absorbing methane layer near TOA where it's colder than 60K. But the base of the nominal troposphere of Uranus is 320K. You need to explain energy flows my friends, and your explanation should be applicable universally - for example, throughout the Solar System and no doubt beyond. "We are determining the temperature gradient within the mass of the atmosphere and the equilibrium temperature is thus at the center of mass. The "effective radiating level" or ERL of planetary atmospheres is located at the approximate center of mass of the atmosphere where the temperature is equal to the equilibrium temperature with the Sun. The equilibrium temperature of Earth with the Sun is commonly assumed to be 255K or -18C as calculated here. As a rough approximation, this height is where the pressure is ~50% of the surface pressure. It is also located at the approximate half-point of the troposphere temperature profile set by the adiabatic lapse rate, since to conserve energy in the troposphere, the increase in temperature from the ERL to the surface is offset by the temperature decrease from the ERL to the tropopause." But all this only works (at least to a fair approximation) with the Earth. It doesn't work at all with the other planets, notably Venus and Mars. Check it out for yourselves. The fundamental premise behind this approach thus fails. Atmosphere on Mars is too thin to sustain much convection, that's why the convection > radiative forcing principle only applies to the planets with thick atmospheres shown in Fig 1 above. Uhm, no. Venus lapse rate: ~8 K/km. 46 bar is at ~12 km. Surface temp: 735K. Temp at 12 km: [735 - (12*8) =] 639K. Venus radiating temperature in space: 184K (Bond albedo 0.9) or 232K (albedo 0.75). Former at 80+ km (0.003 bar), latter at 65 km (0.1 bar). There's plenty of convection on Mars. The ERL is about 2.5 K/km. The surface temp is about the same as the planetary effective emission temperature to space: 210K. by a Hadley-like meridional circulation above the cloud tops18. absorbers at 0.2–0.5 µm (ref. 19)." Venus is a special case and very odd planet in comparison to all the others with thick atmospheres as R&C and others have discussed, including opaque TOA, and convection/lapse rate extends way beyond 0.1 bar up to 0.001 bar as shown by R&C, unlike any of the other planets which were analyzed by R&C, so I'm going to think about this some more regarding center of mass from a thermodynamic standpoint on Venus, and maybe ask Claes Johnson about the CoM concept with respect to the special case of Venus and wrt Earth. Let me know if you have any other suggestions, but just because Mars doesn't apply and Venus could be a special case, no doubt pressure determines the Venus temperature profile, not radiative forcing, so still doesn't support the radiative theory of the GHE vs. the mass/pressure theory of the GHE. I updated the post adding data for Titan, the closest Earth analog with a thick atmosphere, and it appears the CoM assumption is applicable to Titan. Agreed? I believe the Mars discussion founders on empirical observations. Mars is subject to "dust devils" and thus, convection is definitely actively cooling the surface, regardless of the density of the atmosphere. Evidently the same principles applied in the article pertain to Mars. Close, however the earth has *two* photospheres, the solid surface and the cloud tops. The radiative equilibruim height for the equator are the cloudtops, The equilibrium height for the desert areas is the surface. 80% of heat is radiated from the desert surface of the Sahara and australia. Look at infrared images of Meteosat to get the picture. The ERL is (on global average) the height at which T ≈ 255K = equilibrium temperature with the Sun. However, T is a function of P, and radiance/emission spectra a function of T, not the other way around as climatologists assume. I think there is an error in Figure 1. The tic mark labelled 0.5 bar looks to me like 0.4 bar. There is a missing tic mark between that and 1 bar, so it looks right if you count down from 1 but wrong if you count up from 0.1. This messes up the perfect agreement with 255K, more like 260K or more. Yeah looks like R&C left off the tick mark for 1.0 and that's exactly what I did count back from what I thought was 1.0 but is apparently 0.9 instead. Thanks for pointing that out, but Fig 1 from R&C is very low resolution graph anyway to show all of the planets with thick atmospheres on a single graph. P ≈ 0.5 bar and T = 255K at ≈ 5km. As I keep saying, the 255K temperature is invalid because it is for an impossible situation in which there is no water vapour, but supposedly still exactly the same cloud cover reflecting 30% of solar radiation back to space. If you don't reduce (by 30%) the solar radiation to the surface of an Earth without GHG then you get about 278K, not the 255K which Hansen and Pierrehumbert et al claim then leads to 33 degrees of warming. Note also that the altitude about which the temperature profile rotates as water vapour varies is only around 3.5Km to 4Km because we need the altitude where radiation to space from above equals that from below, including the surface. Even the centre of mass is lower than 5Km because of the density gradient which, by the way, also results from the process described in statements of the Second Law of Thermodynamics - in exactly the same way that the temperature gradient evolves as entropy approaches the maximum. 255K is confirmed by the radiosonde data. W R Pratt misses the point that the 255K figure supposedly relates to an imaginary Earth without water vapour or any greenhouse gases. Hence radiosonde data regarding the real Earth with clouds reflecting 30% of the solar radiation is not relevant. My whole point is that there would be no clouds in the absence of water vapour. Yet there in black and white in Pierrehumbert's book we see him multiplying the radiative flux by 0.7 which is deducting the 30% of solar radiation which would not need to be deducted because there would be no clouds. 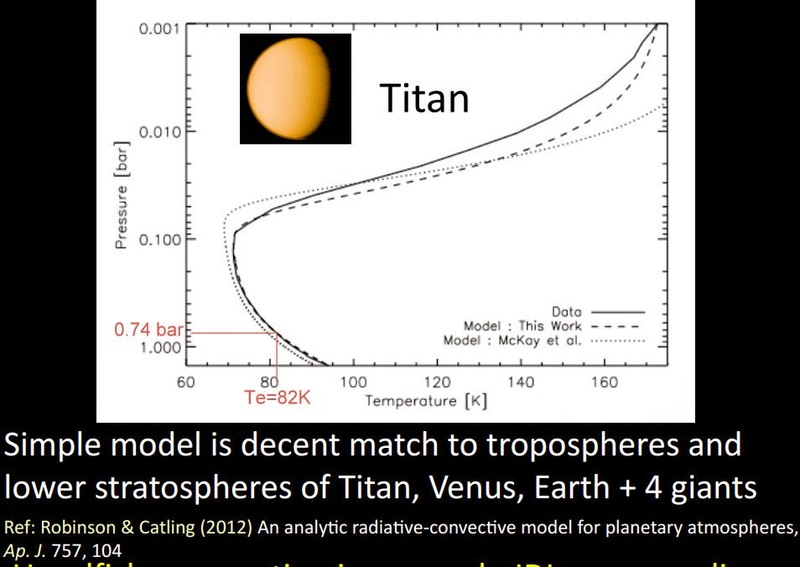 Take out the 0.7 and you get a more correct temperature of 278K for that imaginary dry rocky planet. Is this a valid point? You bet it is. The IPCC clearly claims that the real Earth is 33 degrees hotter than the imaginary planet, whereas in fact it is less than 10 degrees hotter. And even that is very rough and it could be cooler because the 278K figure does not take into account the T^4 relationship. In fact, when water vapour increases from about 1% to 4% we get a few degrees of cooling easily observed in real world temperature data as in my published study in the book. The cooling is at least partly due to cloud cover that increases with increasing water vapour. As I said Doug, 255K is confirmed by the radiosonde data. Regardless of your arguments to the contrary, 255K is observed by satellite and radiosonde data. Empirical evidence is what you are arguing against. Radiation between a warmer surface and a cooler troposphere is cooling the surface. Only radiation from a hotter source can raise the temperature of a cooler target, and only to a maximum as per Stefan Boltzmann calculations. Even those calculations become irrelevant if that target does not meet the definition of a black or grey body that does not gain or lose thermal energy by non-radiative processes, only by radiation. But you can work out the maximum mean surface temperature that radiation could support, and, for 163W/m^2 of solar radiation reaching Earth's surface that mean temperature is around 35 degrees below freezing. The whole concept of "radiative forcing" has absolutely no basis in physics. Radiation from a cooler source can only slow that portion of the cooling of a warmer target which is itself by radiation. Radiation from a colder troposphere does not slow the rate of evaporative cooling or conduction across the surface/atmosphere interface. (See my March 2012 paper.) These non-radiative processes can and will accelerate to nullify the reduction in radiative cooling. In any event, one molecule of carbon dioxide in 2,500 other molecules has absolutely minuscule effect on the rate of radiative cooling of Earth's surface. It does not affect the maximum which must be explained by another process in a completely different paradigm that does indeed operate throughout the Universe. Radiation from the cooler troposphere cannot be added to solar radiation and the total used in Stefan Boltzmann calculations. Even those calculations overstate the temperature because the surface is simultaneously losing energy from some of the solar radiation by non-radiative processes. You need to explain how the necessary thermal energy gets into the surfaces of Earth, Venus etc. And you need to do this in keeping with the laws of physics, as I have done successfully and in agreement with empirical data. MS, my replies to Steven Wilde and Doug Cotton have gone missing. "I suggest spam binning Doug Cotton's 140 personas"
What he does is he will clog up your comments with such reams of his spam and silly pontificating that makes it impossible for anyone to extract any valid content from honest commentators. He's a tool of the alarmist machine working to make critical assessment of the climate scam look unalluring. It's mathematical law...beyond physics law. The average of a sequential distribution is necessarily found around the middle of that distribution, not at either extremity, and thus, in the case of the atmosphere, the bottom must be warmer than the average - middle -, etc, and this arises without any concern or reference to "greenhouse gases" at all, although the "GHG" water vapour makes it cooler, not warmer. The entire basic premises of climate science are wrong, and misattributed. Thanks Joe! and thanks for all your many great articles. I was wondering if you had any thoughts as to applying this center of mass concept to the odd case of Venus heated from both top and bottom? "...is dominated by convection/pressure/lapse rate in the troposphere up to where the tropopause begins at pressure = 0.1bar. When P < 0.1 bar, the atmosphere is too thin to sustain convection..."
1) the tropopause is defined by temperature, not pressure. The tropopause is, on average, about twice as high at the equator than it is at the poles. 2) the vertical limit on convection is, as well, defined by temperature not by pressure. If you have a low/mid-level (below the observed tropopause) temperature inversion, that inversion will cap any convection that cannot exceed the inversion differential...i.e. across most of the tropics. The strength of the Tradewind Inversion caps any deep convection to areas of localized surface convergence (easterly waves, sea breeze fronts, etc. ), areas of broad upper-level divergence & such but the low-level tradewind cumulus area there nearly 24/7. Please read Robinson & Catling Nature 2014. The whole point of that paper is to explain why the tropopause on all those planets is located at P=0.1bar, I.e. The height of the tropopause is set by pressure alone, not radiative forcing from GHGs. Im puzzled by the 0.1 bar aspect. further convection and thereby creates the tropopause. Additionally, there is a slow large scale convective overturning in the stratosphere too. The Brewer Dobson Circulation. "Please read Robinson & Catling Nature 2014. The whole point of that paper is to explain why the tropopause on all those planets is located at P=0.1bar, I.e. The height of the tropopause is set by pressure alone..."
MS - Thanks, but I'm not going to pay the $5. I never once said or implied the tropopause is set by radiative forcing from GHG. You are all missing the point that these figures are based on a "Standard Atmosphere" of a fixed surface temperature. The tropopause is set from the surface temperature & the lapse rate that follows from the surface temperature. That is why the tropopause at the colder poles is lower in height (higher pressure) and is higher in height (lower in pressure) at the warmer equator. Also, convection in the troposphere is capped by the level of the tropopause (regardless what pressure level it is) because the tropopause is defined by the WMO & AMS as a change in the lapse rate not by a fixed pressure level. This has been known since it's discovery back in the late 1800s and is basic meteorology & just because Robinson & Catling want to redefine it does not make it so. Now, regarding your model/equation - if you can change the surface temperature & it will correctly reflect the change in the height of the tropopause, then it holds promise but if you are presuming the tropopause is at a fixed height for the whole globe (pole to equator), it has problems & is wrong. "Yet the radiosonde data clearly shows that over most of the Earths solid surface, most of the year round, the ground is actually cooler than the air above it." Radiosondes do not actually measure the temperature of the "ground". They start by measuring the temperature of the air about 1-2 meters above the ground, which is persistently cooler than the ground itself. Experiments have shown that the coldest part of a nighttime near the ground temperature inversion is about 10 cm above the ground with the ground itself being several degrees warmer than that minimum temp. I didn't say they did. In fact most soundings begin at 150-200 meters above the ground, not 1-2 meters. What I am referring to is the ability to closely predict the surface temperature from radiosonde data, compared to actual ground based measurements. This can be achieved by finding the altitude of -18º C in any particular sounding and then using the normal lapse rate of 6.5º C per km, to calculate the surface temperature. Where the radiosonde data predicts a higher temperature than the actual ground based measurement, then the air directly above the surface is obviously warmer than the ground and vice-versa. Over most of the Earths solid surface however, there is a temperature inversion in the first 4' above the ground. This is the reason why Stevenson screens are always placed 4' above the ground. "Experiments have shown that the coldest part of a nighttime near the ground temperature inversion is about 10 cm above the ground with the ground itself being several degrees warmer than that minimum temp." That will obviously depend on time of year and location. However, at the opposite side of that diurnal cycle, i.e., the warmest part of the day, the air will become warmer than the ground and a near surface temperature inversion will occur in the first 4' above the ground. "This can be achieved by finding the altitude of -18º C in any particular sounding and then using the normal lapse rate of 6.5º C per km, to calculate the surface temperature"
Nice, and do you have a link to the barometric pressure readings that correspond to height where temperature = -18C? And the surface pressure at that same location. By what I'm showing, that height should be where pressure = ~.5*surface pressure. I would say it looks to me, though I haven't looked at pressure until now, that -18º C will be at approximately .5* the surface pressure in ant given sounding. Close enough to back up your work above. Thanks much, when I get a chance I hope to work out several specific examples, and if you have any to share, please let me know. Thanks again for your help. I do have another piece of corroborating evidence I would like to share with you as I said in the email I sent you. If you could reply to that we can discus it further offline. Having had a quick look at the radiosonde data in the link I gave, I'm not seeing any direct link between pressure @ .5 and ERL of -18º C.
All the evidence I have, indicates that Earths atmosphere is heated by direct incident EMR. Pressure is the result, not the cause, but to a large extent pressure, is determined by gravity. While obviously there is a certain amount of variation, the vertical pressure gradient appears to be fairly stable compared to the temperature gradient. "the tropopause separates a stratosphere with a temperature profile that is controlled by the absorption of short-wave solar radiation, from a region below characterized by convection, weather and clouds5, 6. However, it is not obvious why the tropopause occurs at the specific pressure near 0.1 bar. Here we use a simple, physically based model7 to demonstrate that, at atmospheric pressures lower than 0.1 bar, transparency to thermal radiation allows short-wave heating to dominate, creating a stratosphere. At higher pressures, atmospheres become opaque to thermal radiation, causing temperatures to increase with depth and convection to ensue. A common dependence of infrared opacity on pressure, arising from the shared physics of molecular absorption, sets the 0.1 bar tropopause"
So it looks like the pressure reduction to 0.1mb somehow alters the ability of the air to respond to incoming solar radiation such that a temperature inversion is created at or near 0.1mb largely independently of composition though for Earth it is the accumulation of ozone around that pressure point that does the trick for Earth. That's the money quote: "At higher pressures, atmospheres become opaque to thermal radiation, causing temperatures to increase with depth and convection to ensue. A common dependence of infrared opacity on pressure, arising from the shared physics of molecular absorption, sets the 0.1 bar tropopause"
"vertical stratification, with warmer layers above and cooler layers below, makes the stratosphere dynamically stable: there is no regular convection and associated turbulence in this part of the atmosphere. The top of the stratosphere is called the stratopause, above which the temperature decreases with height." Since the Brewer Dobson circulation is so slow perhaps it has little effect? I just added at the end of the post additional reasons why the ERL is set by pressure, not temperature or GHG radiative forcing. Please forgive my ignorance with these questions. Is this fact considered within the relevant calculations? Further, how is this determined and factored in on other planets? Is the Venusian atmosphere also twice as deep at the equator than the poles? If not, how does this change things? We are dealing with global averages in this post, but the same general principle should apply most anywhere since the lapse rate = -g/Cp everywhere. The heat capacity at constant pressure Cp varies widely depending on the pressure and water vapor content, adjusting the lapse rate accordingly. Also the equilibrium temperature with the Sun varies with solar insolation, thus the surface temperature calculation at a given location, but as a global average it is 255K. 1) the tropopause is defined by temperature, not pressure. The tropopause is, on average, about twice as high at the equator than it is at the poles." "Please read Robinson & Catling Nature 2014. The whole point of that paper is to explain why the tropopause on all those planets is located at P=0.1bar, I.e. The height of the tropopause is set by pressure alone, not radiative forcing from GHGs. " OK...at first you disagree with me...then, here, you agree with me...that the tropopause height is 'not' fixed but varies with the surface temperature & is defined as a change in lapse rate which agrees with the WMO & AMS. Your web link confirms that. Please explain...which is it? Comment has been made that the results above do not apply very well to Mars and Venus. This is only to be expected. The Barometric Equations and the Perfect Gas Laws are only true if the Specific Heat Capacity stays constant while the temperature changes. This is true for our atmosphere mainly N2 and O2. It is not true for Mars and Venus where CO2 forms a major part of the atmosphere. Thanks Bryan, that's a very helpful point, and probably explains why the CoM works for Earth and Titan, but not Mars and Venus. "98.4% nitrogen with the remaining 1.6% composed mostly of methane (1.4%) and hydrogen (0.1–0.2%)"
Any other thoughts on the center of mass concept? A general point in the hope that it will assist. Any planet can only retain an atmosphere if energy in equals energy out over the long term. That requires a specific rate of cooling with height which is the 'ideal' lapse rate determined only by mass and gravity. Insolation then determines the length of vertical travel for that ideal lapse rate. Every planet has an atmosphere with a different composition and there is vertical layering plus horizontal mixing which creates a vast plethora of different lapse rates from place to place and time to time. However, ALL those different actual lapse rates MUST net out to the ideal lapse rate if the atmosphere is to be retained. Variable convection sees to it that they do all net out to the ideal lapse rate. There will be differences from planet to planet depending on how the different compositions configure convective overturning but the basic principle applies regardless. The head post is essentially correct even if refinements are possible. Well Stephen, I'm glad to see that you now appear to agree with me (and what's in my book published in March) that there is downward convection transferring thermal energy originally absorbed in the colder upper troposphere (especially on Venus and Uranus) to warmer regions and even into the warmer surface. When I wrote (two years ago) about downward heat transfer by convection (which includes diffusion) you seemed to think I was mistaken. I am not mistaken Stephen, and your comment clearly agrees with what I have said all along, namely that there has to be a non-radiative (convective) heat transfer downwards in lieu of the assumed transfer of thermal energy by radiation into the surface which cannot happen for a warmer surface. As I recall, two years ago,you denied downward convection and insisted on downward diffusion. The former involves movement within the gravitational field thereby changing PE to KE whereas the latter does not. Furthermore, the energy that convects downward is not initially absorbed in the colder upper troposphere from incoming solar energy. Instead it is in the form of gravitational potential energy created by uplift from lower levels that then descends and reverts to heat as it does so. You can have direct absorption of energy from radiative gases higher up and that will be conducted downward as well as upward but it often doesn't reach the surface where there is convective overturning in a lower layer such as in our troposphere beneath or warmer ozone heated stratosphere. So, no we are not yet in agreement. There is indeed warming of the surface from convective overturning but that is not diffusion and describing it as a downward flow of thermal energy is incorrect because you miss out the conversion of thermal energy (KE) to gravitational potential energy (GPE) and back again. MS, I think you should consider highlighting the two last posts of yours as features posts or something. They are both beyond my professional skills but seem to warrant a wider discussion. Thanks. Blogger doesn't have a "sticky post" feature to keep posts at the top, but I am going to be posting more on these issues with new posts linking back to these posts, so hopefully the discussion will continue. Thanks for your interest. Note to Doug Cotton: I've received several complaints from readers to stop allowing you to spam threads. You've made your same points many times. The purpose of this thread is my GHE derivation, not your book, so I'm not publishing any more of your comments. Take care. I think you are on the right track, but as far a Venus not working out, well it's hard to apply something derived from the ideal gas laws to non-gases. The surface of Venus basically has no gas at all, it really only has CO2 as a super-critical fluid. For your formula to work, you need to apply it only to gases - I suggest only going down into Venus's atmosphere to the bottom of the gaseous envelope - not to the surface. However, it's correct to say that Venus is not hot because of the GHE; how can greenhouse gases 'trap heat' and keep the surface warm all through the Venusian 58-day 'night' when there is no sun? Less that 10% of the sun's energy reaches the surface anyway. In the video shown here CO2 warming in the lower atmosphere is attributed to the following process: "....Near the Earth's surface, carbon dioxide absorbs radiation escaping Earth, but before it can radiate the energy to space, frequent collisions with other molecules in the dense lower atmosphere force the carbon dioxide to release energy as heat, thus warming the air.....". Does your model consider this?